I had the opportunity to attend Microconf, a conference for self-funded entrepreneurs that run technology businesses, earlier this week. One of the challenges that they gave attendees was to identify three actionable takeaways that you can implement in your business in the next few months. While many attendees came away with tactical strategies they can implement in their business short term, I identified some much more fundamental issues with my company that need to be addressed. These changes will fundamentally change the future direction of my company’s brand and its products and services. 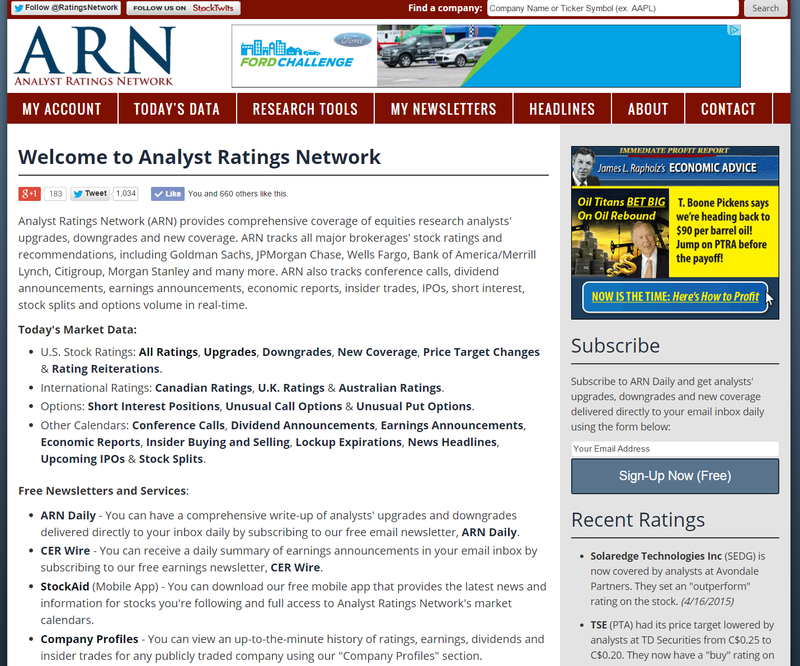 First, I became painfully aware that Analyst Ratings Network is a horrible name for a business. It’s too long, too complicated and too hard to remember. A number of people asked me about my business, and when they tried to repeat the name of the business, it usually came back as “Analyst Network” or something else inaccurate. A good brand name needs to be memorable and adequately describe what your business does. 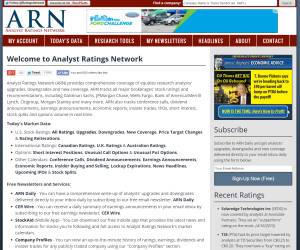 Analyst Ratings Network fails to meet both those qualifications, especially because Analyst Ratings Network does much more than reporting on equities research/analyst ratings. There’s a 90% chance that I’m going to change the name of the business in the next 6 months. The two leading contenders for a new name are “Ticker Report” (I own the domain already) and “ARN Financial News” (which would be an easier brand transition). Second, my company’s product offerings are too complicated. Currently, we offer four separate newsletters (two free, two paid), an e-book, a piece of investment research software and an all-access pass that contains everything we sell. There are overlapping features between these products and it’s hard to explain the differences between them. The product comparison page is a mess (and doesn’t even compare all of our products). Over the next 6 months, I plan to dramatically simplify the services we offer. We’ll have one free newsletter (ARN Daily), one paid newsletter (ARN Daily Premium) and a new product called ARN Research Pro (which will be the highest-level version of ARN Daily Premium). We’re going to lose some of our monthly recurring revenue by shutting down our other paid newsletter, but ultimately it’s the right direction for the brand. Third, we need to substantially improve the customer experience on our website. The Analyst Ratings Network website needs help. The menu structure is convoluted and there’s way too much text on the homepage. The confusing product offerings need to be simplified. We need to add a “help” section and we need to create an onboarding experience to train customers to use our website. We need to have a clearer funnel on the website and make our products center stage. Finally, I need to double down on automation and systemization. Whenever you’re taking a vacation or going on a trip, it becomes really easy to identify the weaknesses in your business. There are things that have to get done that just don’t get done or get done later than they should because you have a limited amount of time to work. Specifically, I need to train my assistant to take over managing the advertising campaigns that run on our mailing list, find someone to take over day-to-day bookkeeping and get better level two customer support in place. While there are some big issues I need to address, I don’t want to paint a picture that the business isn’t going well. We just hit 185,000 subscribers on our mailing list, have a record number of paid subscribers and are on track to do more than $2 million in revenue in 2015. We’re attracting more than 20,000 new subscribers organically each month. The numbers are better than they have ever been. I’ve only been focusing on projects that can be directly measured at the expense of the company’s brand and overall user experience. It’s time to change that. It goes without saying that I have a lot of work to do to tackle these issues. It’s not easy to revamp your product structure when you have 3,000 people paying you for a product on a monthly basis and it’s even harder to change the name of an existing brand, but ultimately these are the steps that I need to take to get to my business to the next level. I hope to report to my fellow Microconf attendees that I’ve accomplished all of these goals by Microconf 2016. Good comments Matt. We've found that the "product and feature creep" can really get out of hand, but you don't know it until you stop one day and realize, "what the heck are we doing?" Looking forward to seeing the changes. Awesome post Matt! I look forward to hearing updates as you move forward with implementing what you've learned. I'm sitting down now myself to map out my own to-do's for the next year. Hope to see you again next year and hear all about it! Always learning, and improving. Love it. Congrats, Matt! I'll be there. Already talking to an agency about the rebrand! Thanks for sharing your insights, Matt. Really interesting to read.